MARK: MY WORD malbert@mmsonline.com Mark Albert EDITORIAL DIRECTOR MMS MAY 2018 16 mmsonline.com What Should Be on Our Minds Overall, the conference speakers at last month's Manufacturing for Growth (MFG) Meeting in Miami, Florida, presented a coherent theme about the future of manufacturing: There is no short-term or long-term thinking anymore. Thinking must concentrate on current trends and how to keep up with them. Here is my take on the presentations and the major points from the topics covered at the event. The pace of change is accel- erating. It is striking that in many respects, the futuristic lifestyle of the Jetsons is already here, and it arrived sooner than expected. Likewise, the digitalization of manufacturing is occurring rapidly. The fast will beat the slow (being big is no advantage over being small). Knowledge is valid only momentar- ily, so refresh your thinking often. Manufacturers must become software companies. They will use computer technology (perhaps homegrown) to automate the quoting, design optimization, engineering and CNC pro- gramming functions to create a more compelling customer experience. One result will be a blending of additive and subtractive processes. The bottom line will still be the same: great parts (with all the pertinent data attached), delivered on time at a competitive price. Smarts will make machines more produc- tive. Machine tools will become faster, more powerful, more flexible and more capable (with expanded multitasking). However, the big gains in productivity will come from "in-process optimi- zation" of cutter performance, positioning respon- siveness and part probing. Machine tools will shine as digital product data processors. Cybersecurity is still critical. Cyberattacks and successful data breaches are inevitable, so the key is early detection and effective damage con- trol. However, the greatest threat to a company's network and the data it holds comes from insiders being careless or poorly trained. Recent tax reforms will have mixed results. Big corporations are likely to be the most affected (and they may reap the biggest benefits). Expect some unexpected consequences. In the meantime, small manufacturing companies should pay more attention to the existing R&D tax credit—the cost of all those test cuts and runoffs may be deductible. Business is strong—for now. One economist made it clear that the current economic picture is rosy, and the next slowdown will be relatively mild. The advice to manufacturers is to plan investments in new technology now and implement them as soon as you can take a breather. 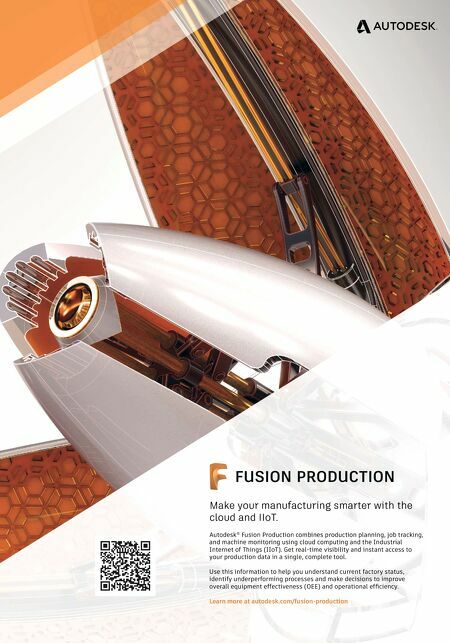 Micro-factories make sense. Direct digital manufacturing calls for networks of local, highly specialized "micro-factories" to replace highly capitalized, centralized assembly lines. Electric vehicles will have far fewer components. The number of moving parts will drop. This makes local, small-scale production feasible for micro-factories. Machining job shops will have a new role. An energy crisis might be coming. Sure, we will have plenty of fuel, but workforces that are fully energized, engaged and inspired may be in short supply. Teamwork is essential in the race to digital proficiency. However, going forward, the company team will be more diverse yet must be more cohesive and self-reliant. The MFG Meeting brings together members of AMT–The Association For Manufacturing Technology and the National Tooling & Machining Association (NTMA). Attendees seemed to be opti- mistic but on the alert, an appropriate attitude for facing the future. 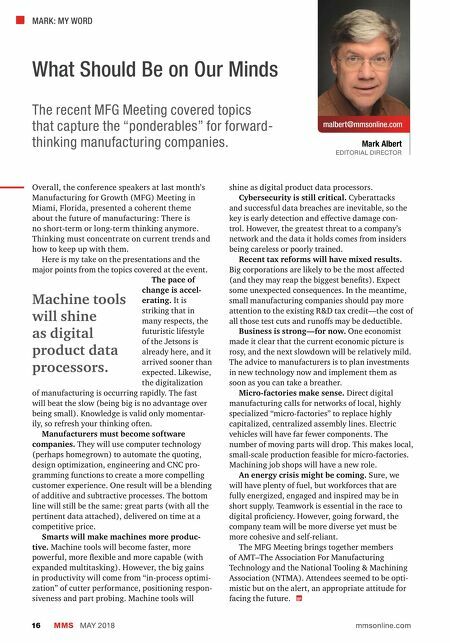 The recent MFG Meeting covered topics that capture the "ponderables" for forward- thinking manufacturing companies. Machine tools will shine as digital product data processors.